In Europe's uninhabited far west islands a non-native hebe (hee-bee) shrub takes up uninvited residence on the roof of a 'clochán' (corballed stone beehive hut) used to store ghost-like wool sacks. 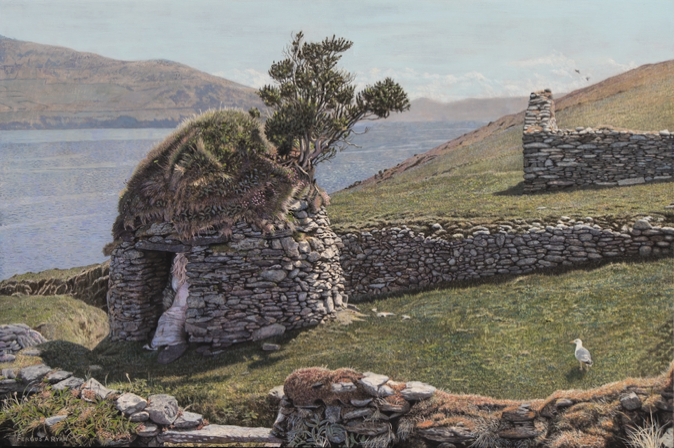 On the nearby mystical Skellig islands ancient Christian monastic clochán cells date from possibly as early as the sixth century, and featured in the latest Star Wars films. This clochán on Great Blasket Island is probably a feature of more recent centuries.